Cameron Warren (CW) is the Social Media Manager for the Food Recovery Network at the University of North Carolina, Greensboro (UNCG). She began volunteering with Food Recovery Network her first semester at the University of North Carolina at Greensboro in the Fall 2016 Semester. In the Spring 2017 semester, the Social Media Manager Executive Board Member position opened up. She applied for the position and the rest is history. Olivia Biro (OB), is an FRN volunteer at UNCG. She got involved with FRN my freshman year of college, when Cameron told her about the organization. She enjoys doing recoveries and meeting sustainability-conscious people through the organization. She was chosen as Volunteer of the Month last year, and she hopes to continue and expand her involvement in FRN at UNCG. Olivia (left) and Cameron (right) enjoying the vegan potluck. On Monday, November 12, 2018, we attended the Civil Rights, Food Justice, and Climate Change event sponsored by UNCG’s Environment and Sustainability Program, the African-American Diaspora Studies Program, and the Humanities Network and Consortium. There was such a great turnout and we were so happy that we could be there to represent FRN! 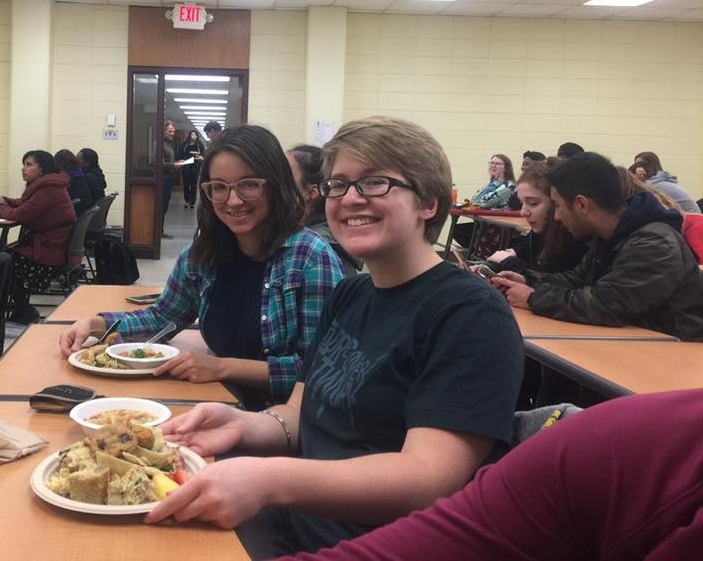 CW: The event held a vegan potluck with food provided by the students in Dr. Meredith Powers' "Environmental Justice" course. The food varied from beans, vegan sushi, soups, to vegan dips, and vegan cookies; it was really cool and I really appreciated the amount of effort these students put in to provide a dinner that everyone could eat. The keynote speaker for the event was Chef Njathi Kabui, an internationally celebrated organic chef, urban farmer, and food activist. He told captivating stories from his childhood growing up in Kenya. He spoke about the intersection of issues related to food justice, public health, race, and colonialism. He made a statement that night that will resonate with me for a lifetime. He said that “environmental issues, health issues, and food issues derive from an imbalance and unfair distribution of power.” He later said that “there is no such thing as food deserts; there are only power deserts.” Chef Kabui provided a fresh and new perspective on issues relating to civil rights, food justice, and sustainability. OB: Kabui then went on to say that food is “the most political thing you will ever touch in your life.” His stories made me think about the many forms that activism and social justice can take, particularly when agriculture and the environment are the central issues. FRN is a way to remind myself and others of the problem food waste presents while working towards a solution. If food is one of the most political things I will ever touch, food recoveries are political action. CW: Before I began my work with the Food Recovery Network, I thought that people were poor because they grew up in hard, unfortunate situations and were having a difficult time overcoming those circumstances. However, working on more recoveries and attending this event have made me see more clearly how these unfortunate situations are linked to a disproportion of power between communities, especially communities that have historically been disadvantaged and discriminated against. In this country, we do not have a food shortage problem; we have a food distribution problem and it's directly linked to the unequal distribution of power. As I move forward through my Food Recovery Network experience, I will use my privilege to help those communities that are underprivileged and bring awareness to this issue.